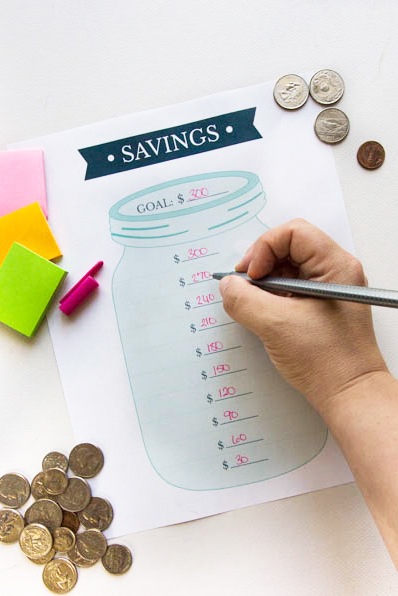 Our bank account could use a little boost, so I’m declaring this month “Money-Making Month!” Download a copy of the free printable savings goal tracker to use as a visual reminder of that big money goal you are saving toward. And keep reading to learn how I’m planning to make some extra cash this month. I’m declaring this month “Money-Making Month” in our house. Between a few one-off expenses and a couple financial goals I’m determined to hit this year, our bank account could use a little boost. We’re halfway through the year so now’s the time to kick it up a couple gears! So, for the month of July, I’m going to do some form of money-making activity every weekday. You’ve probably heard of people doing “no-spend months” and “Frugal February”. But as I was looking at our budget the other day, I kept coming back to the conclusion that we just need more money coming in. There are things we can be more frugal about for sure, but in general we’ve done a lot of work to minimize our household expenses so I don’t feel like we have that much more we are really willing to cut. Which is why I’ve decided to work on earning a bit of extra cash this month! Of course, I can’t start a new goal without some type of printable or planner to get myself organized and track my progress. I’m a bit of a planning nerd that way! 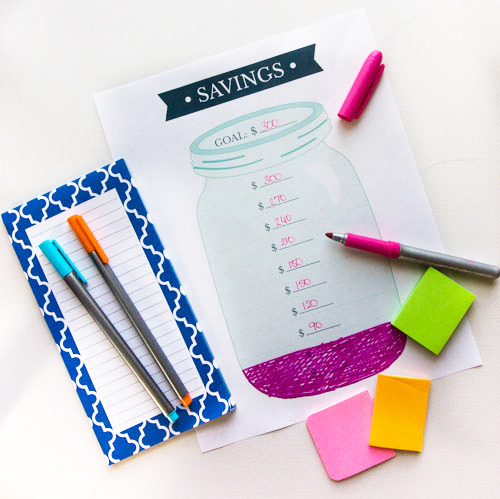 Keep reading to snag your copy of the cute savings goal tracker printable I made and learn how we’re planning to earn extra cash this month. 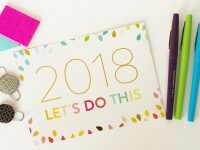 I have some big financial goals for 2018 and, after realizing we’re already halfway through the calendar year, I know I need to kick it into high gear. I always determine a couple action steps I can take during the month that will help me get closer to my annual goals, and this month I’ve decided to focus my energy on bringing in more money. While most people have a tendency to try to cut back on expenses (and that’s a logical place to start), we’ve already done a decent job of trimming our expenses and I don’t think there’s a lot more we are willing to give up right now. But as I was updating our household budget the other day, I kept thinking “if only I had an extra couple hundred dollars”. We’ve incurred a couple out-of-the-ordinary expenses recently that have taken a hit on our bank account. I use YNAB (You Need A Budget) to track our budget and I log into it every few days to see how we’re doing (I seriously love how easy it is for me to see where I money is going with YNAB!). I was allocating a recent paycheck to our upcoming bills and I kept thinking that even just a couple hundred extra dollars would make such a big difference in propelling us forward! Maybe you can relate to feeling like you’ll never get ahead, and you know how awesome it would feel to have a little bit extra to put toward something. So I set a goal of a dollar amount I want to bring in as extra money this month. 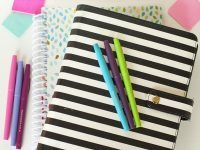 I thought it may be helpful for you in your own financial journey, so I’m sharing my Money-Making Month plan with you today along with a printable savings goal tracker. For the month of July, I’ve set a goal of earning $300 above and beyond what we normally earn in a month. So obviously our regular paychecks don’t count, but neither does any of my blogging or freelance income that we’re already expecting to receive this month. The $300 is somewhat arbitrary, but I chose that number because it seems a bit larger than I think I can realistically achieve. When I set goals, I always try to go one rung on the ladder higher than I feel comfortable. I think I can fairly easily come up with $200 in extra cash this month, but $300 is going to take more effort. I also chose that number because that’s about how much we owe on a specific bill I really, really, really want to pay off this month. If you are planning your own Money-Making Month, you’ll need to decide on a dollar amount goal. This will be different for every family. Maybe you’re like me and have a specific bill or debt you could pay off if you only had a little bit of extra money in your budget. 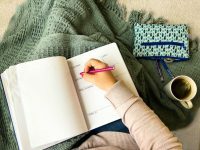 Writing down a list of ideas you have for earning extra money may help you determine what a realistic goal is for you. Goal setting is no good without an action plan, so I brainstormed a list of things I can do to earn extra money this month. Now I’ll admit that as I was writing this post, I fell down the rabbit hole of Google for a while researching all of the little ways to earn a few dollars here and there online. But I stopped myself because that’s not the point of this article and reading up on every little survey site and rewards program just to earn a couple bucks is a total waste of my time right now. Not because those things couldn’t be helpful, but because I already have plenty of ideas for “low-hanging fruit” things I can do to earn cash. Selling Unwanted Stuff – This will be our main money-maker this month. There are quite a few things around the house that I’ve been meaning to list for sale on Facebook Marketplace and Craigslist but I never get around to listing them. There are also several boxes left unopened from our move last fall so I can also rummage through them for things that might be worth selling. I can’t think of any super high-dollar things to sell or I would have adjusted my monthly money goal higher. Store Returns – I have several bags of purchases that have been riding around in my truck for far too long just waiting to be returned to the store (please tell me I’m not the only one who does this!). I already returned a few things to Target earlier this week and made $56! Now obviously that’s money I already spent so I’m not exactly earning any new money by returning things, but I’m counting returns toward my goal because I want that money back in my pocket! I’m also going to count any money we get from redeeming pop cans. In Iowa, we pay a 5¢ redemption fee on every soda can/bottle purchased and get that money back when we recycle them later. David drinks a ton of Diet Coke and we tend to accumulate bags and bags of cans in the garage so this is the month to clean out our stash! Secret Shopping – I’m a registered secret shopper for Bestmark and Second To None. Mystery shopping can be a great way to bring in a bit of extra cash. I haven’t done a lot of these before and there aren’t always that many in my area (you’d probably have a lot more options in larger cities). But I regularly sign up for secret shop assignments at my local grocery store and before we moved I always got our car’s oil changes reimbursed through a secret shop. Their pay isn’t usually worth it to me unless it’s something I would do anyway. But as an example, David and I have gone out to eat a couple times and got our meal reimbursed plus paid an extra $20 for completing the shop. I’m going to see if there are a couple I can sign up for this month. Cleaning – I found a $20 bill in a purse earlier this summer so I’m sure there’s more cash and change hidden around here! Maybe with a little cleaning I will hit the jackpot. Negotiate Subscriptions & Plans – We have a few phone calls to make to places like our auto insurance and phone bill to see if we can get a lower monthly rate or perhaps switch to a different plan with a lower monthly fee. If we can save ourselves a little money this way, I’ll count it toward our monthly goal. Surveys/Ebates/Swagbucks – These are just a few of the many websites out there where you can earn a few extra dollars here and there for completing surveys, watching ads or making purchases. I don’t usually spend my time on these, but I do already have accounts so I may turn to them if I need a little extra money to hit our goal. To monitor our progress and keep our Money-Making Month goal top of mind, I created a simple savings goal tracker. If you know me, you know I love a good printable and I couldn’t resist designing one to track my progress this month ;). 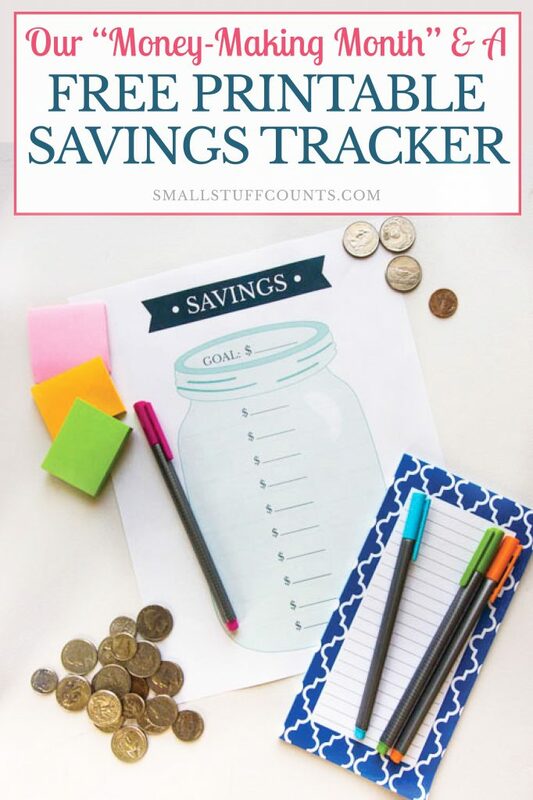 Fill in the form below and I’ll gladly share the savings tracker with you. Hang it on your fridge or tape it in your planner so you can track your income and progress toward your own financial goal. 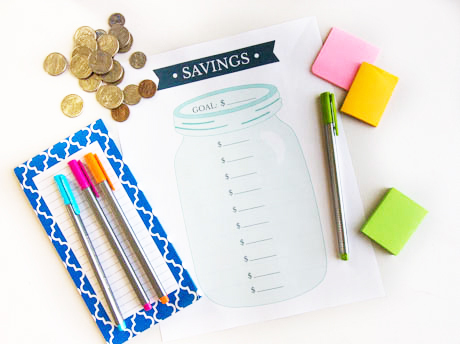 Use this printable savings tracker as a visual reminder of a big financial goal you want to reach. Print a copy and color in the jar as you progress closer to your goal. Subscribe to have the free printable PDF sent straight to your inbox. 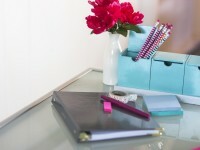 You will also receive weekly emails with organizing tips and more printables. Is a “Money-Making Month” something you’ll try out? I’m hoping it will motivate me to put a bit of extra effort into earning some cash this month so we can give our bank account a small boost. Hanging the savings goal tracker on the fridge will help me track our progress as the month goes on. And if you want to get a better handle on your household budget, I can’t recommend YNAB highly enough. I don’t like numbers, but this budgeting tool works in a way that makes sense to my brain and it’s really helped us learn where our money is going. Use my affiliate link to sign up for a 34-day free trial of YNAB.